I received some snack size packages (0.53 oz each) of Bare Fruit in crunchy cinnamon apple chips to try out and share my opinion with you guys. Each of these bags contains 1 apple! This is great if you are trying to portion control. What I really liked about these snacks is the peel is still on the apple which I feel adds lots to the taste and texture of the product. The apples are not overly coated in cinnamon so the sweetness of the apples really comes out. My kids did not seem to enjoy the apples as much as I did, I think it was a texture/mouth feel issue with them. But hey, that's okay, that means more for me :) . Would I recommend this product? YES!!! They have a great flavor, 50 calories per 15 g and are pretty much just filled with the good stuff. Ingredients: Apples and Cinnamon--could that get any simpler? And it's not just apples! :) They also have dried apricots and mangos! YUMMY!! Now for the best part! 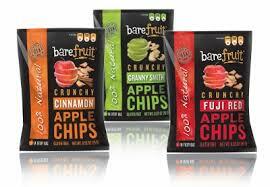 Bare Fruit would like to send 1 of my lucky readers a case of apple chips FREE!